Alice, 38, spends her days sleeping.Working nights at a rehabilitation center provides her an accessible excuse that conceals fatigue and emotional apathy. Yigal, Alice's husband, feels lonely and tormented by her chilly attitude, while his pent up anger gradually heightens. Eli, her 9 year old son, is desperate for her love. The rehabilitation center houses and treats thirty young women who have suffered emotional crisis. Alice prefers as little communication as possible with the girls and performs only the basic demands of her job: Handing out medication, supervising meals and overseeing shower time. After lights out, in her small room in the staff area, Alice meets Yoel, her lover. On the narrow single bed, a passion for another kind of life, for what might have been, is aroused. The girls' volcanic emotional world reflects how desolate Alice's life is in contrast. Thus, she cannot remain on the sidelines for too long. The confrontations of a dominant young woman on the one hand and the dependence of another, hurl her into a power triangle that will have devastating consequences. "For the complex script that deals with the desperate need for love and the inability to receive it. 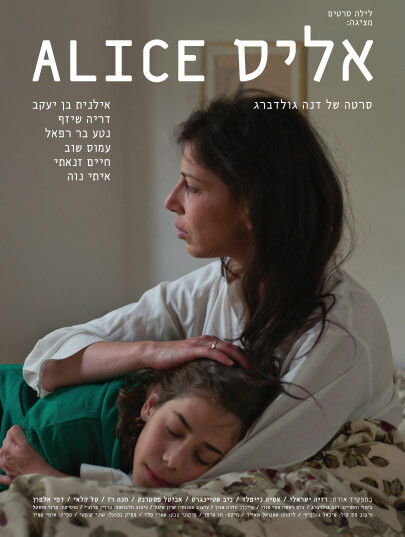 Dana Goldberg created several in-depth characters, led by Alice, wife and mother"
Goldberg, who directed and wrote Alice, was awarded Most Promising Director at the Women's Film Festival in Rehovot, '09.